About 2 weeks ago I was on my way to the airport to attend the Joey L workshop in New York. I was psyched to have a weekend of photography with a photographer who’s work I consider to be the top of commercial photography. I was hoping to come away with some tips, some tricks, and most of all a new enthusiasm for photography. So was it worth it? I don’t know. Shortly after the workshop ended I still don’t know if it was worth the expense (around $1800 with travel). Before I delve into what we did, let me start with what’s left me the most uneasy about the decision to go. When I supported his Kickstarter and pledged my $1000 I was REALLY excited. I texted my photo friends and told them all about it. I’ve been following his work for 5 or 6 years and it was exciting to learn from him. Then a few weeks ago I got an email from CreativeLIVE that said something like “JoeyL Teaching His Commercial Techniques on CreativeLIVE! Pre order for just $99!” Ninety-nine dollars, or 1/10th the amount I had paid for the workshop and 1/20th the amount I paid with travel. My heart sunk a little bit. I wanted to go to New York to learn tips that only the select few who really supported him would be learning. I wanted to come back and teach my photo friends some cool new thing I learned that you could only have picked up by studying with the master. After a few minutes I told myself there’s no way he’d do these workshops around the world (his first ever I believe), and then devalue that by doing the exact same thing on CreativeLIVE. The first day I got to the workshop and met some new people. Joey and his assistants were setting up, there was a good buzz. We were all chatting as we waited for the class to start. When it did, he said the words I didn’t want to hear... This will be the exact same thing as the class I’m doing on CreativeLIVE. Again, I was disappointed. But then I was even more disappointed when I realized not only would it be the same, it would be more. CreativeLIVE is a 3 day workshop, this was 2 days. So for 1/20th the cost, I could have gotten 33% more! It didn’t make sense to me, but what can you do? I’m here, I’ll try to make the best of it. Day One started with Joey taking us through the new news on his film. It was interesting to learn how it had changed and a little about the tech side (they’re shooting on an Arri Alexa). Then he went into his theory on light, talked through some examples and showing some behind the scenes stuff, some of the topics I hoped we’d cover. That’s when he lost me. We spent the next hour or two talking about his lighting approach and kinds of lighting. The first part was interesting. He talked about the way he approaches lighting and how he builds until he has the look he had in mind. Versus throwing up a bunch he builds piece by piece. Then he talked about the lights themselves. Not why he uses Profoto (the color consistency) or why a beauty dish vs octabank (beauty dish feels more comical), but “main lights” “rim or back lights” and “background lights”. Some high school photo 101 stuff. I understand that not everyone is at the same skill level, but I would have thought basic photography would have been a prerequisite. And I think that was my big take away from the weekend. There were 2 NYC workshops in a row and they should have been structured for skill level. Workshop 1 for the more beginners, workshop 2 for the more advanced. I’m a semi-professional photographer but I know what a main, key, rim, fill, etc light is. And if the class was more than 7 hours a day (more on that later), okay. But time is precious and beginner stuff should already be known before getting to a workshop like this. After the 101 lesson we went through some of his images and he showed us behind the scenes photos and talked about why he lit it how he did and how his approach has changed over time. After that he’d pull up a shot and people took a stab at dissecting the lighting. It was interesting because he had behind the scenes stuff to show the lighting and how simple stuff could look really complex and complex simple. Then we broke for lunch. Lunch took a while. Like over an hour. At the time it felt like a lot of sitting around, but maybe Joey needed a break. After lunch was my favorite part of the day. We did a “location scout” and he took us through 3 setups, showing how and why he lit the way he did. Each set up got a little more complex and was interesting to see how he approached it. I learned a couple things during this. Then came the biggest waste of the workshop. After he set up each shot, tuned it in and it was locked we broke into 3 groups and each photographed the scene. This was 2 hours of the 6 hour day (7 hours minus an hour for lunch). We spent 1/3 of the day and almost 20% of the entire workshop shooting stuff that had no technical learning and we couldn’t use for our books or anything. He handed the settings down to us so we didn’t even figure out aperture and shutter speed. It’s not like I can use the shots for a portfolio piece, I didn’t set it up, light it, or even figure out the settings. I just pushed the shutter. This was a complete waste of time. I came to learn from one of my favorite photographers, not spend a couple hours shooting un usable images. This is the point that I realized I had probably made a mistake. I wasn’t going to get the inspiration and I wasn’t learning much. Plus now that he had announced that creative live I was just paying 1800% more than those people to learn the same things. Day one ended about 4:30 (a half hour early) and we all broke out and headed home. I walked out with another guy from the workshop who described it perfectly, he said “that was a little light”. And that’s perfect. It’s not that I didn’t pick up 2 or 3 things or enjoy seeing Joey set up those 3 shots, but it was light. It didn’t delve into anything, it was all very top line and beginner. On to Day Two. After the previous day I was hoping that today would come through for me. We started by talking about why personal work is important. It’s a great topic for anyone who hasn’t heard a pro talk about it. After that we went through what makes a good portfolio, what portfolios Joey thinks are well put together and then why he does his like he does. After that there as some open critique of people in the class’ websites. I had hoped to be able to have mine done but we were only able to do 3-4. After portfolios was what I thought would be (and ended up being) my favorite part of the weekend. Joey did what he called a portfolio shoot. Basically a high production shoot that the final image might work as a piece in his book. Start to finish he talked us through his decisions. From hand painted background to lighting approach. It was really interesting and what I had hoped the whole workshop would be. Part way through he got an idea and we saw how the whole shoot shifted to try something new. It was cool. I believe this is where we broke for lunch. Again, a very long lunch for a workshop. This one was almost 80 minutes. After that we headed to our computers for a photoshop talk. This is another spot where I hoped to pick up some great tips. I didn’t. It was all pretty basic stuff. I learned a new way to desaturate which was interesting. But the rest of it was things like “when you want to dodge and burn things export the RAW file with multiple exposures, bring it into photoshop, and layer mask it to do what you want it to do”. Interesting if I was in photo 101 but every photographer I know does this. The rest of the stuff was just ok. Class ended early (again) at 4:30. It worked for me because I had a flight to Dallas for a photo shoot the next morning. But usually workshops are so packed with great info that you run late. So that’s my long winded review. I love Joey’s work and picked up a few tips. I never would have spent $1000 on the workshop and $800 on travel/hotel/food/taxi/etc if I had known he was doing the CreativeLIVE thing. I bought the CL class and watched parts of it. It was more interesting than the Workshop. It had more information and it cut out the waste of time having the class shoot. And it included everything the Workshop had. CreativeLIVE is free to watch and $99 to buy before/during the workshop. I spent $1700 more for less. CreativeLIVE is 3 days instead of 2, and because he skipped the shoot it yourself part they got an extra 1/3 of that first day too. It’s disappointing. From last night's amazing show. So I've been a bit behind on blogging. Whoops. 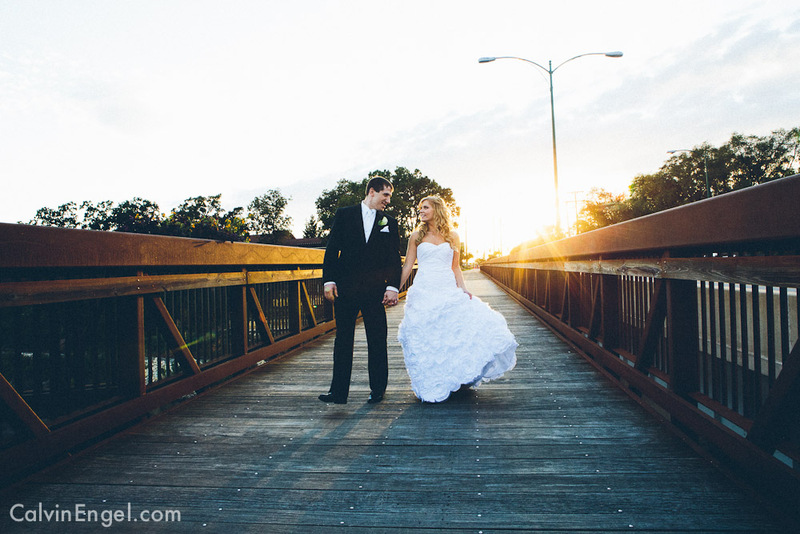 This is a quick look at a wedding I shot in October for Nick + Nikki. It was my first Greek Orthodox service and it was a lot of fun. My assistant and I went out to Rockford early in the morning and shot more photos than I ever have at another wedding. It was a great time and they were a great couple. Paste Magazine put together a sweet infographic of who the best labels are each year based on the year-end best of lists. They explain it better than that here. That about sums up the decor around the office I'm working in. I will not make any more boring art! This is a great little mini documentary on the artist John Baldessari.